The COPS relay team that struck gold. From the left are Mollie Allen, Aisling Ruff, Chloe Hannam and Taylor Goodby. 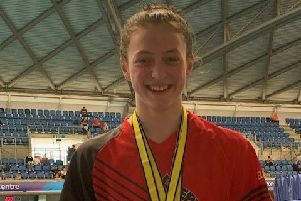 It was another golden day for City of Peterborough Swimming Club (COPS) at the ASA National Championships in Sheffield yesterday (Agugust 7). They picked up gold and silver medals and there was yet another medal for 15 year-old Jamie Scholes. Jamie Scholes with his silver medal. Last week he picked up six medals in the British Championships and he returned to Ponds Forge to compete in the 100m freestyle event. In his heat Scholes set a new personal best (PB) time of 55.51 and was the third fastest qualifier. In the final he was almost a body length down on the leader at the turn but a terrific last 50m saw him catch up and he was only just pipped to the gold. He secured the silver with another PB of 54.43. The women’s 17yrs and over 4x200m freestyle relay team qualified for their final with a time of 8:51.25 which was the fastest time in the heats. In the final Chloe Hannam gave them a commanding lead by bettering her heat time by nearly two seconds at 2:04.29. She handed over to Mollie Allen who improved her time in the heats by a massive 4.7 seconds to clock 2:09.50 and stretch the team’s lead further. Taylor Goodby swam the third leg with a time of 2:15.85 to maintain the lead and she handed over to Aisling Ruff who swam her leg in 2:14.76 to win the gold medal for COPS in a time of 8:44.40. The women’s 14/16 yrs 4x200m freestyle relay team suffered a setback just before their heat when Hanna Jaszkiewicz was taken ill and Mia Leech (13) stepped in to take her place. Christie Woods, Poppy Leech, Mia Leech and Holly Jaszkiewicz put in a herculean performance but were placed 11th in the heat with a total time of 8:55.04 to just miss out on qualification for the final. Mia Leech had earlier qualified for the final of the 50m breaststroke setting a new PB of 35.83 which placed her fifth fastest in the final. However, despite improving her time again to 35.67 she finished in seventh place. Thirteen year-old Amelia Monaghan qualified for her the 200m backstroke final in a time of 2:28.53 which placed her in 10th place and that was also her final position. Taylor Goodby (17) also qualified for the 200m backstroke final with a big PB of 2:23.53 which placed ninth fastest and that’s where she finished in the final. Jaxon Simmons (15) was again competing in two events. The first was the 200m individual medley multi classification event in which he swam the fourth fastest time of 2:39.82 but on disability points classification he was placed 13th. In the 50m freestyle multi classification event he fared better clocking a new PB of 29.86 in the heat earning him 470 disability points and placing him in ninth position for the final. In the final Simmons again set a new PB of 29.15 which earned him 538 disability points and eighth place overall. Fifteen year-old Hanna Jaszkiewicz had earlier swum the 50m breaststroke and was placed 19th with a time of 37.50 in that event and the 200m backstroke event where she finished 14th with a time of 2:30.32 before she was forced to withdraw from the relay event. Fourteen year-old Joe Welch clocked a time of 1:15.81 in the 100m breaststroke for 12th place and James Newton (17) clocked 1:10.37 to finish 16th in the same event.